The way food is produced distributed and consumed in Britain today is shaped by a complex history spanning 1000 years of struggle. Understanding this history is essential in understanding the way things are today, not just for land workers but for all of us. It is a social history that leaves a divisive legacy across our landscape, our people, our food and our daily work, entrenching poverty and privilege in Britain. Any serious attempts to create local, sustainable food systems must address it. The history of Britain has been driven by the dispossession of land based communities as the ownership of fields, forest and commons has been progressively concentrated into the hands of a few powerful landowners. Over the centuries our ancestors have faced enclosures and clearances, the loss of common land and grazing rights and the development of a culture of exclusive land ownership and prohibitive land prices, all intimately connected with the process of industrialisation and colonialism. From this history we look out today on a country where over 75 % of the land is owned by less than 1% of the population, where the average age of a farmer is over 60 and where less than 1% of the population work on the land. Corporate business dominates all levels of our food system, resulting in complicated and fast moving supply chains where prices for producers are squeezed and scandals such as contamination, gang labour and health scares are increasingly common. The relationship between land ownership and food systems is clear. Between 2007 and 2013 the EU lost over 25% of its farms because an agricultural industry based on chemical inputs, large land holdings and a high degree of mechanisation is the only farm capable of surviving in a food system dominated by a few big retailers. That kind of agricultural industry leads inevitably to the exploitation of the land, the producers and the health of those who consume its products, whilst making it harder and harder for people with alternative ideas to get a foot hold on the farming ladder. A just and more sustainable food and farming system would involve short supply chains and a multiplicity of small scale sustainable food producers. Such a system can deliver healthy nutritious food with responsible environmental stewardship and the creation of more meaningful land based livelihoods. However, to do this we need a change of perspective on land and food: we need to understand that the right to food and the right to land go hand in hand. The story is told in different ways in different places but essentially it goes like this: a destitute man wearily stumbles down a country lane on winters evening and finding a field sheltered from the wind by a good sturdy fence, climbs over and beds down for the night. In the morning, he wakes with a start, a lady is prodding him with her cane. “Is it?” the man asks, waking up. “It certainly is, I own it!” the lady snaps. “What a silly question!” the lady exclaims “why, my father owned it”. “And how did he come by?” the man enquires. “Well they fought for it of course”. “Right” says the man getting to his feet and rolling up his sleeves, “then I’ll fight you for it”. The story exposes the absurdity of our system of land ownership. Whether by direct violence or making a killing in business there is something crazy about anyone laying claim to large tracts of land for private amusemnet or gain while the majority of us cannot lay claim to “one handful of earth”. “The earth was made a common treasury for all” declared Gerrard Winstanly of the 17th centrury Diggers. To them the land should be worked communally and it’s fruits divided equally. 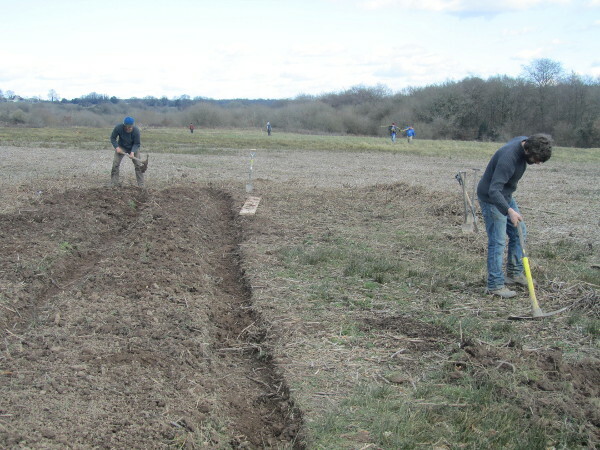 A co-operative alternative to the Diggers’ collectivist approach might be that, at the least those who wish to live and/or work on the land should be given control of that which they can manage in a sustainable and productive way: no more, no less. These are just two “models” of a fairer system of land distribution; there are plenty more voiced and yet to be voiced. What they all have in common is that they throw into stark relief the fact that the current land ownership system continues to reward downright theft and is ultimately a cause of many of our current environmnatal, social and economc ills. All over the world people are finding ways to take back control of their food. In 1993 small organisiataions defending the livelihoods of peasant farmers in South America united to form La Via Campesina. Now a global organisation representing over 200 million small sale farmers and producers, La Via Campesia developed the concept of food sovereignty as a practical basis for rebuilding our food system. Food sovereignty calls for the right to food controlled by and for people and communities not for big business elites and private profit. The purpose of the food system should be to feed the population in a way that is sustainable and equitable and this can only happen by building local food systems – bringing producers and consumers closer together in a system that is locally controlled by them, that reduces food miles and environmental damage, values food providers and builds knowledge and skills around food growing. The demands of food sovereignty inevitably call for new patterns of land ownership and land distribution as part of this shift to local democratic control of food production. Britain could be self sufficient in food fuel and fibre if the right decisions were made about land use and consumption. The biggest blocks in making these decisions are the structures of ownership, planning law and corporate monopolies that prevent people from engaging in food growing as a viable livelihood. I understand why, but I wanted to know how and when . The actual story of this projects beginnings. Who did what when and where.